Find premium tires in Brooklyn Center at your neighborhood Firestone Complete Auto Care store. Let our team of tire experts help you find the right tires. On the hunt for new tires in Brooklyn Center? Your search is over at Firestone Complete Auto Care. It doesn't matter whether you drive sports car or a family-friendly minivan, you’ll find the right tires for less. 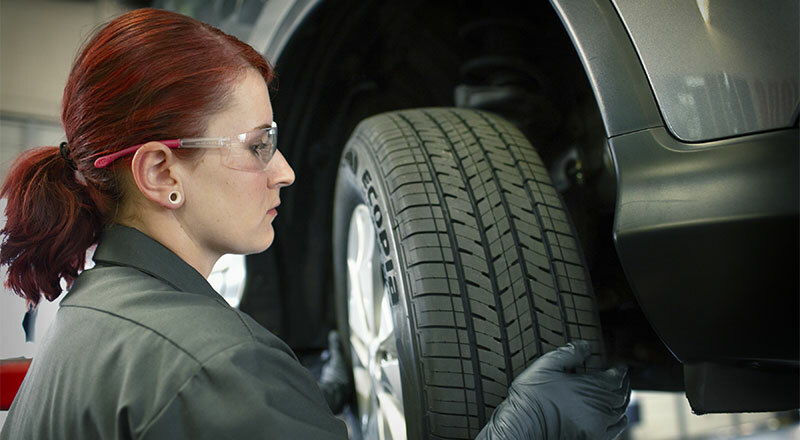 Our technicians will help you decide the best tires for your vehicle, driving style, and climate. Shop our huge tire catalog online and learn more about trusted brands like Bridgestone and Firestone. Then schedule your installation at a time that's convenient for you! From studded winter tires to slick sport tires, Firestone Complete Auto Care has what your vehicle needs. Not sure if you really need new tires? Our experienced technicians can help, but you can do some investigating on your own. First, check your current tires for tread wear. If the treads are barely noticeable, your tires might struggle to grip the road safely. And that's not safe! Watch out for tears, bumps, bulges, or cracks in the sidewalls, and note the age of the tire. Aside from your tread condition, vehicle manufacturers typically recommend replacing tires every 6 to 10 years. It can be a safety concern, a main priority for us at Firestone Complete Auto Care in Brooklyn Center. Chart a course towards adventure or a more fuel-efficient commute with the best tires for your car from Firestone Complete Auto Care. We'll hook you up with the size you need from the most trusted brands, including Bridgestone, Firestone, and Primewell. Trust us with your tires and you'll enjoy more than just expert installation. We'll also provide you with free pressure and tread checks, as well as trustworthy tire patching and plugging, rotation, and alignment. We've been a choice tire shop in Brooklyn Center for many years, and a leading tire provider in the U.S. for close to a century. For amazing service at affordable prices, come to Firestone Complete Auto Care. Browse tires online and schedule your installation today! From oil changes to batteries to headlight replacements, turn to your local Firestone Complete Auto Care for your automotive service needs. We're an automotive shop, tire store, and car care center wrapped into one. Our professional technicians work hard to help keep your vehicle performing its best. When you bring your car or truck to us for maintenance, we promise affordable prices and exceptional service. Experience the difference! Make an appointment for auto service in Brooklyn Center, Minnesota today.